I was looking at a 100 trillion dollar banknote from Zimbabwe the other day. On top of all the noughts, they come with an issue and use by date - in this case June 30, 2010. It occurred to me that should we fail to beat Slovenia, I would have around $1,000 of Follow England tickets of not dissimilar value. Happily, I have not now been saddled by FIFA with Slovenia-Ghana tickets for Rustenburg and will instead be watching a perhaps fated re-match with the Old Enemy in Bloemfontein on Sunday. Should we avoid losing to Germany on pens for once, I am told we have an easy route to the final with potential ties against Argentina, Spain and Brazil. 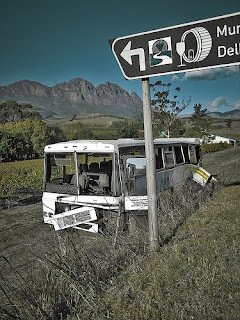 My trip to Port Elizabeth began in familiar fashion when the overnight Intercape bus broke down and began billowing smoke alarmingly from its rear on a mountain pass an hour into the journey from Cape Town. It took a mechanic an hour to turn up and fiddle around to no effect, then another hour for a replacement bus to show. After the 15 hour trip, the only accommodation I could find was at a hostel run by a mad woman, who claimed to have freed Nelson Mandela and been in De Klerk's cabinet. My rather unlikely breakfast companions were a young Brit from Marlborough College public school and a Zambian car salesman. Only the Zambian, who had not eaten for three days, ordered the Full English. In Cape Town I met an Australian who said he had been waiting all his life to see England. He had been the proud owner of 15 replica England kits, watched the Premiership avidly and phoned his father excitedly from the Algeria game to say he was watching Wayne Rooney live. A couple of days later, he was still stunned at how awful England had been. Thankfully, they got their act together with a nerve-jangling win against Slovenia - population two million - but failed to score the second goal that would have seen them play Ghana and Uruguay/South Korea for a semi-final berth. While watching the Germans' inevitable win afterwards, I saw some English fans scuffling with two locals, who had apparently been trying to rob them. Within thirty seconds, there were four police cars at the scene and around a dozen burly officers, who, shall we say, did not treat the suspects with kid gloves. You wouldn't get a response like that in London. 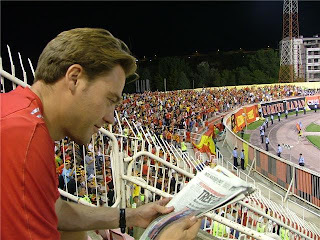 Here's our man Tim watching (well sort of) England away in Skopje, Macedonia. 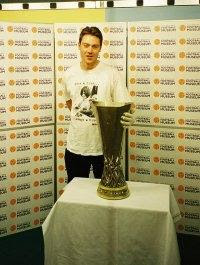 This'll be him with the UEFA Cup earlier. 29 years earlier. Ipswich Town fan and that you see. In other news, I went up Table Mountain on foot in jeans and plimsolls. It was pretty much a continuous rock climb for which I was completely inappropriately dressed. Hilariously, I met a Scotsman of feeble physique I know from back home toiling shambolically halfway up. He is probably still there now. 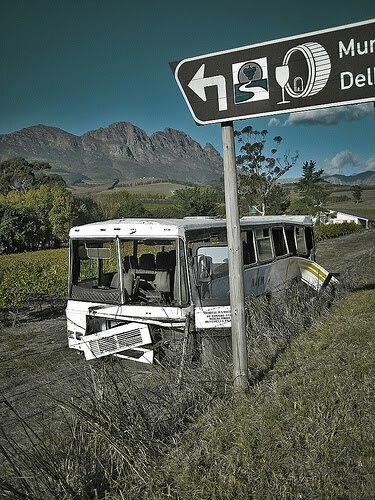 I now plan to see the Garden Route at my leisure before heading to Bloemfontein.